It’s a tribute to how much the specialty coffee world has changed over the last ten years that the style of coffee traditionally associated with Panama – clean, soft, balanced, gently fruit- and floral-toned – hardly showed up among the coffees nominated by roasters for this month’s article. True, Panama coffees of any kind very nearly didn’t show up, given the harvest was late and our article was scheduled a little too early. Nevertheless, we did manage to sample eighteen high-end Panamas, of which an impressive thirteen scored 90 or higher. But only two of those thirteen (15%) fit the criteria for a traditional Panama coffee: wet-processed and produced from a mix of familiar cultivars of Arabica: Typica, Caturra, Catuaí, Bourbon. The others? Six of the top-rated thirteen Panamas were “naturals” – dried in the fruit. In a similar cupping of Panamas ten years ago none would have been naturals; all would have been conventionally wet-processed. Seven of thirteen were produced exclusively from trees of the now-celebrated Gesha or Geisha variety of Arabica. Ten years ago this spectacularly distinctive-tasting variety hadn’t even entered the specialty coffee world’s vocabulary or blown away its collective olfactory systems. Four of the seven Geshas we reviewed were additionally goosed with an alternative processing method. Three were processed by the dried-in-the-fruit or “natural” method and one by the “honey” method, meaning the skins were removed from the beans but the fruit flesh was allowed to stay on the bean as it dried. Only three were traditionally wet-processed, meaning that all of the soft fruit residue, including the flesh or pulp, was removed before the beans were dried. So, again, only two of the thirteen 90-and-over Panamas fit the criteria for a traditional Panama: produced from Varieties-Not-Called-Gesha and processed by the orthodox wet or washed method. This shift in practice at the top end of Panama coffee production was clearly reflected in the format of the 2012 Best of Panama green coffee competition. The results of the competition were divided into three categories: Geshas (in this case processed by the wet method only), Naturals (any variety including Geshas; it turned out that the three top-rated in this category also were Geshas), and “Traditionals” (any variety not called Gesha processed by the conventional wet method or honey method). Thus it appears that the very high end of Panama coffee production is increasingly identified with the Gesha variety, while processing method is a complete toss-up. Such uncoupling of origin from traditional coffee type is going on everywhere in the specialty coffee world, but it appears to be prevailing with particular thoroughness in Panama. Why is Panama so precocious? In part, of course, it isn’t, since a lot of good conventionally wet-processed coffees from a mix of familiar varieties continue to be shipped out of Panama. But the farms on the slopes of Volcan Barú that make up the small membership of the Specialty Coffee Association of Panama definitely are precocious. The families owning these farms are technically sophisticated and appear to be thoroughly networked into the larger world of specialty coffee, particularly the top end of the American and Asian markets. For those who have only recently tuned in, Gesha/Geisha is a variety of Arabica with a startlingly distinctive flavor profile (complex, intense, often lavender-like floral character with cocoa-nib-like chocolate) that originated in Ethiopia but was first “discovered” by the coffee world after it was found growing on Price Peterson’s Hacienda La Esmeralda farm in the Boquete region of Panama and subsequently blew away the judges at a Panama green coffee competition in 2004. Why Does Gesha Cost So Much? Because there still isn’t enough of it. Since introducing the variety to the world, the Peterson family has considerably expanded its Gesha production. Geshas also are coming to market from other farms in Panama as well as from other regions in Latin America, particularly Colombia and Costa Rica. Nevertheless, Gesha continues to command very high prices because supply continues to fall short of demand. For this year’s crop, for example, the highest-priced Geshas from the Hacienda La Esmeralda farm sold at auction for around $66 per pound for the green, unroasted beans. That means these beans probably sell roasted for at least twice that amount, or the equivalent of around $120 per pound. The least expensive Gesha in the La Esmeralda 2012 auction sold for around $30 per pound, green and unroasted. Eventually, of course, enough farmers will plant enough Gesha to bring down its price, but for now, demand continues to outstrip production and prices remain quite high. Are All Geshas Equal? This variety appears remarkably stable in its basic flavor characteristics, regardless of where it is grown. Nevertheless, from year to year and from farm to farm the intensity, balance and completeness of the Gesha character vary greatly. 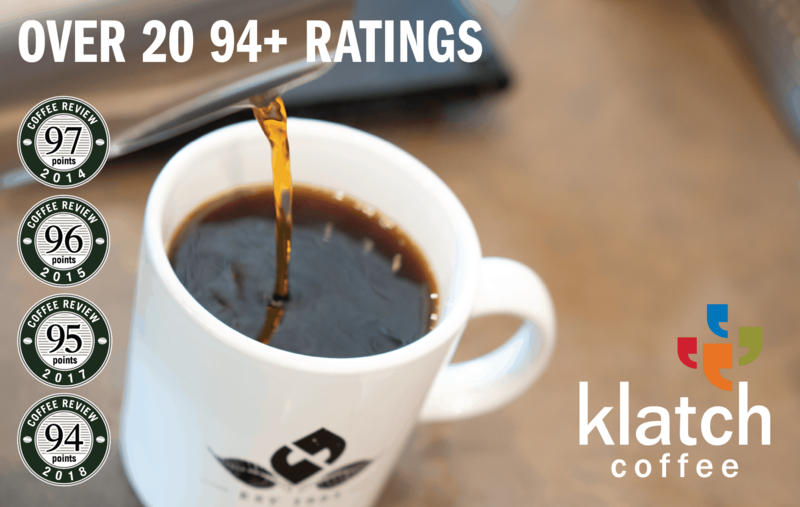 This month’s Klatch Coffee Esmeralda León (96) was spectacularly intense and complete in its Geshaness. On the other hand, we also cupped two similarly wet-processed Geshas from other batches in the 2012 Esmeralda line-up that were attractive coffees in the Gesha style, definitely over 90, but not nearly as intense, complex and complete as the Klatch León. Over the past couple of years other farms both in Panama and elsewhere have produced Geshas that in our view are as good as or better than the best Esmeralda production, but again, we have no idea how consistent these new productions will be over the long run. In short, we have yet to cup a Gesha that we have rated less than 91, but those that push higher – 93 to 97 – have varied by farm and by year. Are Geshas Worth the Price? 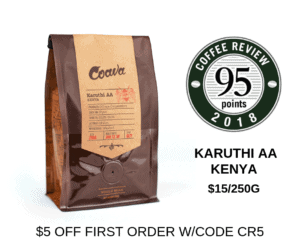 Two of this month’s four highest rated Geshas were “naturals,” dried in the fruit rather than conventionally wet-processed: the Klatch Coffee Don Pachi (94) and the CafeTasters Esmeralda Natural (93). A third was “honey” processed: Simon Hsieh’s Panama Geisha Honey (93). This result hints at an interesting speculation: It is possible that Geshas may particularly benefit from alternative processing methods. It appeared to us that these alternative processes, which when well-executed tend to round acidity and consolidate and deepen aroma/flavor notes, could be particularly well suited to bring balance and depth to the intense jostling of assertive high notes in the Gesha profile. A caveat, however. All of the naturals reviewed this month, including the two splendid “non-Gesha” Elida Estate naturals from Willoughby’s (93) and Klatch (93) respectively, were superbly executed dried-in-the-fruit coffees. The salty, bitter finish and exaggerated fruit ferment that often mar dried-in-the-fruit coffees were nowhere in evidence. Taken together these four top-rated natural-process Panamas, two Geshas and two “non-Geshas,” seem to suggest that some producers, in Panama at least, finally understand how to handle the challenges of drying coffee in the fruit. 2012 The Coffee Review. All rights reserved.